Visvakarma Jayanthi. 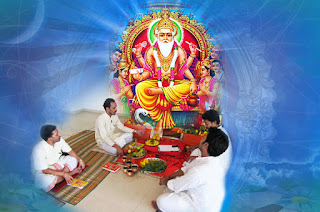 Vishwakarma Jayanthi is celebrated by all industrial houses, artists, craftsmen, and weavers. The festival is observed on Kanya Sankranti (16 September in 2016) which follows the Ganesh Puja. It was on this particular day that the forefathers of the present Visvakarma people invented the plough and gave it to humanity. The plough represents both the artisan trade as well as agriculture and therefore becomes the representative symbol of the ancient Indian civilisation. It changed the course of human history altogether. This was a change from ‘local mob culture to universal human culture’ and Vishwakarmas of India pioneered it. Coincidentally, this also becomes the birthday of Rsi/Silpi Visvakarma. So Indians in the past celebrated this day of many illustrious conjunctions as an occasion to honor Vishwakarma and his descendants.